Flying to coordinates unknown, the Wikk kids land the Phoenix on planet Evad and descend into an ancient jungle. Revealed is a highly intelligent civilization, whose inhabitants have now vanished, leaving behind astonishing technology! High stakes lead the Wikk kids on a dizzying ride from the pinnacle of a ziggurat into an endless underwater labyrinth. Dive into adventure, as the twins face a deadly showdown with the evil Ubel! Can they win the struggle to survive the savage snares, with the help of the elusive Brother Sam? The aspect that makes this book in particular stand out for me is the power struggle between Oliver and Austin. Seriously, if you substituted my living room for an abandoned jungle planet, this could be me and certain brothers who shall remain nameless. ;) In fact, that's probably the part of this story that pulled me in more than anything, given that I was coming in partway through the adventure and had very little idea what was happening. But even though I still heartily sympathize with Oliver at almost every point, the author does a great job of balancing the argument and showing different perspectives and motivations in a sympathetic way. That's not to say that certain characters don't grow and change and admit they were wrong (bonus points! ), but none of them are ever totally unlikable, even when they're frustrating. The adventure and danger kicks up a notch in this book (or maybe my perspective is a bit skewed because I already knew the outcome going into the first book--I really don't recommend reading them out of order). Dangerous journeys, threatening creatures, chases by soldiers--it's quite a ride! On the spiritual side, the truth of the quest is beginning to be revealed; there's not much concrete understanding yet, but the symbolism is strong. Take a deep breath when you finish this one; you'll need it going into Unleash! My children have loved this series and have enjoyed following the progression of events. Risk does a good job of continuing the story line and adding new, exciting elements to the story. Just like the first book in the series (Taken), this book is action packed, full of twists and turns. 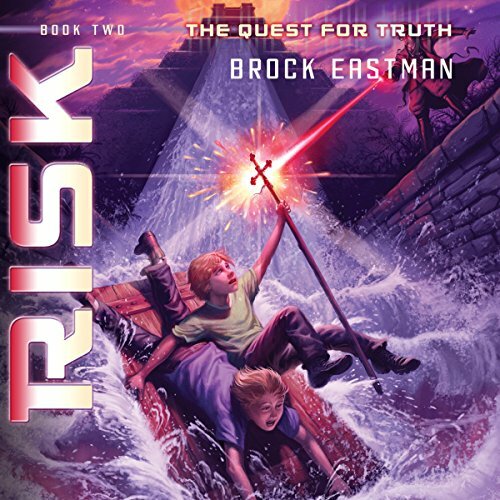 Risk is the second book in the series that Brock Eastman wrote about kids that are very serious about their mission, which is to rescue their parents from helping the enemy who is trying to take over the Galaxy. Follow the kids as they conquer dangerous hardships and nerve-racking friendships. Adventure continues and we're loving it! Would you listen to Risk again? Why? Yes! our whole family loves this adventure - from the 4 y/o up to the 37 y/o! Its family-friendly but has tense parts and thrilling parts and sweet parts - something for everyone! What about LC Kane’s performance did you like? we love hearing the pronunciations of the characters and places as intended by the author. Listening to Kane also helps us get through some of the bigger-word description/"jargon" that is a little harder for my younger readers/listeners when they're reading on their own or listening to mommy! we have the hard copies of The Quest for Truth books and are reading them as well as listening (we're further along than the audible versions so far). I HIGHLY recommend listening to the audible of the 1st book (Taken) either before or while reading the hard copy. It is so helpful in hearing the names/words of the characters that we wouldn't know how to pronounce and so now as we read the books ourselves (either as family read-alouds or my 8 y/o on her own), we read with the pronunciations as intended! We got a clearer picture of the characters by listening to the audible narration! I have really enjoyed this book series so far. The story continues at a fast pace. There are plenty of twists and turns to keep you engaged throughout the book.I do get pretty irritated with one of the caricatures because they just don't ever seem to learn their lessen. Oh well. I guess we all know someone like that though. This book would be one I can listen to in the car with my kids. Where does Risk rank among all the audiobooks you’ve listened to so far? Mason Was My Favorite... He Adapted To Everything..
What does LC Kane bring to the story that you wouldn’t experience if you just read the book? She Brought The Evil Captain To Life Superbly! I have been listening to this series with my kids (13, 11 & 9 yrs) and we've all been loving it. My daughter is the age of the twins in the story and she has commented on how dead on the author understand boys at that age and their level of stupidity, especially Austin-thinking he is smarter, braver, and should be the one in charge... It was really great to see the progression of all the characters and to see them grow and begin working together. This is a great family friendly story that everyone will enjoy. It picks up right where Taken leaves off and moves at a fast enough pace to keep everyone's attention with all the twist and turns and clues that they have to figure out. The narration is amazing and makes it even more fun to listen to. I loved how the adventure continued and how Biblical truths were tied into the story in such wonderful ways. I loved the descriptiveness of the planet and buildings on Evad. It felt like I was there.